'Harmonium' (Marky Smith, R. 2001). Seedling #95-27Y. 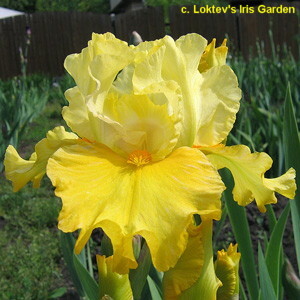 IB, 27" (69 cm), Midseason bloom. Sulphur yellow (RHS 6A), falls with darker lemon yellow (13B) shoulders; style arms cream, sulphur edges and crests; beards strong saffron yellow (21A); glaciata; ruffled; slight spicy fragrance. 'Flights Of Fancy' x 'Brash'. Aitken 2002.